“Cardio oncology: preliminary results from the ERIC-Onc study; new insights on cardio-toxicity associated with anthracyclines”. “Practical strategies for managing cardiac iron overload”. 02-04/02/2018, Kuala Lumpur, Malaysia, International Workshop on iron Overload (IOW an ApoPharma sponsored educational event). “Minimising the cardiac complications in TM”. “Workshops on Cardiovascular complications: face to face case discussions with local physicians”. 17-18/06/2017, Thessaloniki, Greece, Symposium on Cardiac Complications in Thalassaemia. “New Advances and cardiac complications: Early diagnosis and monitoring”. 05/05/2017, London, National Thrombosis Week Conference: Cancer Associated Thrombosis (CAT) Symposium. “Anticoagulation for non-valvular AF during chemotherapy”. 08-09/04/2017, Pretoria, Cardiology At the Limits Satellite Meeting. “Cardio-Oncology a new era for Cardio-protection”. 05-08/03/2017, Havana, Cuba, The 4th International Symposium New Frontiers in Cardiovascular Research. Heart disease associated with cancer and its therapy, Oportunities for cardio protection- the emerging discipline of cardio-oncology”. 25-26/02/2017, Bali, Indonesia, Iron Overload Workshop – Thalassaemia: Opportunities to enhance patient care. ApoPharma Inc.
“Thalassaemia: Practical strategies in cardiac care for Thalassaemia”. “Guidelines for cardiac care in Thalassaemia”. 13/02/2017, Kuwait, ApoPharma Satellite Symposium 3 at the 6th Pan Arab Hematology Congress 2017. “Management of Cardiac Iron – Prevention and Treatment”. 24-27/11/2016, Lima, Peru, International CMR Course Lima. “Cardio-Oncology a new paradigm for heart disease prevention”. “Cardio toxicity in cancer therapy”. 28/10/2016, Hamburg, Germany, Thalassaemia Major – Continuum of Care. “Management of Cardiac Iron prevention and treatment”. 29/09/2016, Vancouver, Canada, Cardio-Oncology Summit. “Effect of remote ischemic preconditioning in oncology patients undergoing chemotherapy”. 24-25/09/2016, New Delhi, India, 6th International Conference on Thalassaemia. Participation in this International Conference organised by a local charity (Thalassaemics India). Provided informal consultative advice for a Thalassaemia clinical “camp” at the Sir Ganga Ram Hospital where patients and their local physicians travelled from all over India for an interactive Q&A session. 26-29/08/2016, China, Iron Overload Workshop (IOW). “Cardiac complications in Thalassaemia – the importance of iron (Fe) control”. . Invitation from Beijing Med-pharm Co. (Sanofi) to undertake lectures as part of the IOW series in Shenzen and Nanning, PRC. 15/11/2014, Dubai, UAE, UAE Hematology Congress. Speaker on the subject: “American Heart Association New Consensus Statement for Cardiac Care in Thalassaemia”. Part of a seminar series for doctors and associated health professionals, aiming to improve the treatment of TM in the Middle East. Sponsored by ApoPharma. 13/11/2014, Macassar, Indonesia, Indonesian Hematology Society. Speaker on the subject: “Cardiovascular Investigation and Care for TM patients”. A major local hematology conference for Indonesia with 1 of the 4 days devoted to the hemoglobinopathies. 09/10/2014, Genoa, Italy, VIII Congresso Nazionale S.I.T.E. Speaker on the subject:”American Heart Association New Consensus Statement for Cardiac Care in Thalassaemia”. Session shared with Prof. Antonio Piga. Invited by the National Hematology Society devoted to thalassaemia and other hemoglobinopathies (S.I.T.E.). 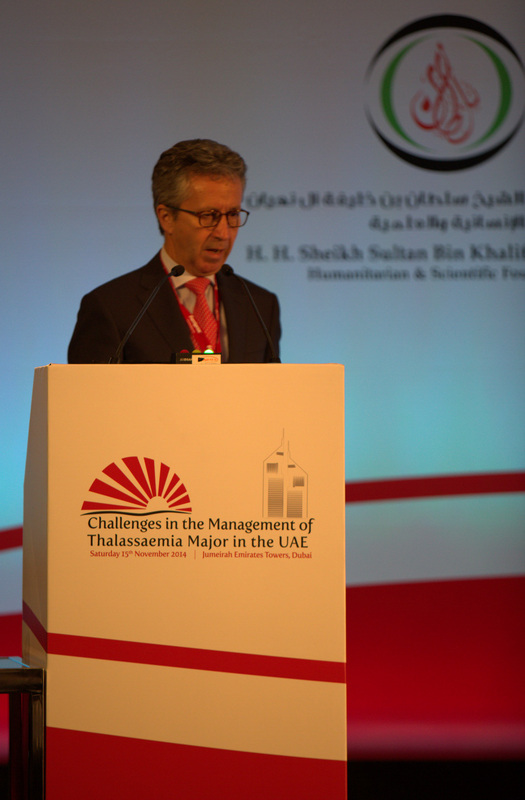 19/09/2014, Muscat, Oman, Challenges in the Management of Thalassaemia. Speaker on the subject: “The importance of cardiac iron removal”. 25/08/2014, Grand Baie, Mauritius, International Cardiovascular Meeting. Joint programme director and speaker on the subject: “Exercise as treatment in cardiovascular disease”. A cardiovascular conference set up as a joint initiative between UCLH, the Hatter Cardiovascular Institute and the Department of Health & Quality of Life, Republic of Mauritius. 01/06/2014, UK, British Cardiac Society Annual Conference. Abstract selector & co-chair of sessions. Basic science (myocardial & vascular biology). Annual three-day scientific conference of the UK’s cardiology society. I have undertaken this role every year since 2010. 17/05/2014, Rome, Italy, Challenges in the Management of Thalassaemia. Speaker & discussant during break-out sessions on the subject: “Cardiac iron load and toxicity: the importance of iron reduction and increasing cardiac output”. A two-day multi-faculty, multi-disciplinary meeting aiming to improve the treatment of thalassaemia and other haemoglobin disorders. Sponsored by ApoPharma. 20/03/2014, Abu Dhabi, UAE, 4th Emirates Hematology Conference. Speaker on the subject: “Cardiovascular complications of TM and their management”. Invited by UEA society of hematology; faculty member and speaker. 20/10/2013, Abu Dhabi, UAE, TIF Scientific Congress. Scientific advisor to TIF and speaker on the subject: “Heart Disease in TM”. TIF is the WHO-supported patient charity, whose remit is to improve thalassaemia care world-wide. Conferences are attended by clinician specialists and by patients and their carers. 27/09/2013, Le Marche, Italy, Peri-operative Care of the Cardiothoracic Patient. Speaker, two lectures on the following subjects: “The heart in haemoglobinopathies”; and “Cardio-oncology, the emergence of a new specialty”. UCLH/Heart Hospital Joint meeting with St. Barts supported by the Royal College of Anaesthetists. 22/09/2013, Manchester, UK, UKTS Patients and Parents Conference. Scientific advisor to TIF and speaker on the subject: “Managing the heart in TM”. UKTS is the patient-led charity for the UK. It holds annual conferences for patients and their families. Lectures and seminars are given to the TM patients and their carers. 30/05/2013, Doha, Qatar, Understanding Thalassaemia Major. Speaker on the subject: “The importance of monitoring T2* and cardiac function in TM”.